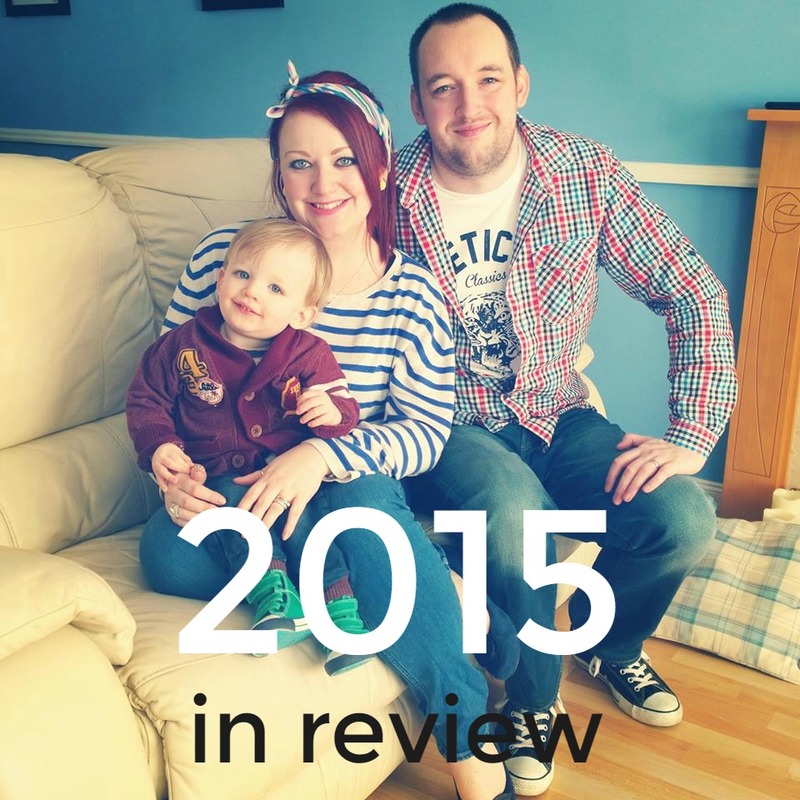 Last year, I shared a post reflecting back on everything I had shared on here and I fancied doing the same for the past 12 months. It's a good thing to do, as you can remind yourself of how far you've come and what you've enjoyed as well as seeing where the next year could take you if you make the effort or change that's needed. Personally, I'm glad to be saying goodbye to 2015 for various reasons. You can't really blame a year in itself for not being what you had wanted but I still like the idea of welcoming in a new one with all the hope a fresh start offers. January I reflected on a year of being a working mum, the importance of choosing me time and shared a few healthy breakfast ideas too. 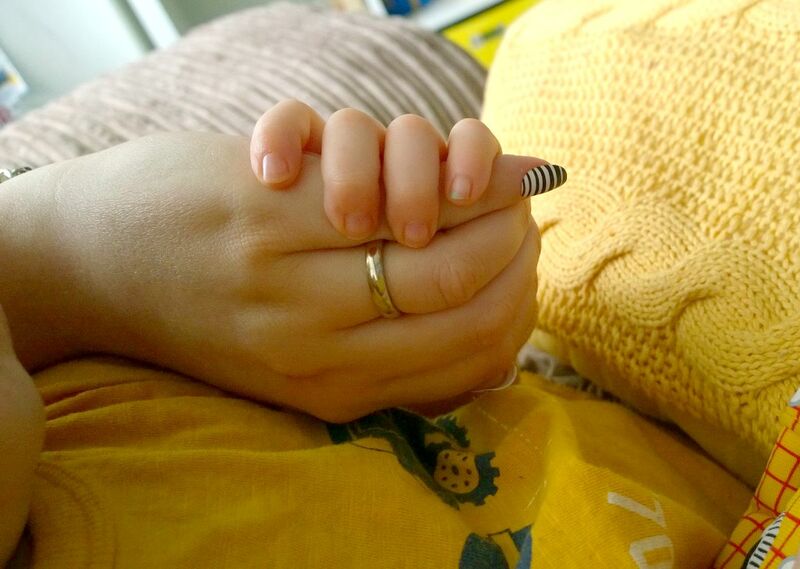 February: I wrote about how the idea of 'being mum' isn't a destination but rather a journey, full of twists and milestones, plus I wrote a post about when you learn you're going to be a mum for the first time. I also posted my recipe for brilliant bruschetta. Yum. March I carried on learning about eating clean and wrote about how I needed to shake off a kind of lethargy I was going through at the time. I felt that way a lot in 2015 but the new year will be different; I'm determined to make time and do more of the things I want and need to in order to be happy. I also asked the question why don't we put ourselves first, and I think it's something that struck a chord with quite a few people. We went to West Midlands Safari Park to meet some dinosaurs, I shared some Easter food ideas and hubs even had a spot on the blog too. It was a bumper month! I'm just going to come out and say the thing that you know half the people you know are going to say. The half that will be all positive vibes on 1st January and who have the best of intentions. The opposite of the other half who laugh at the first half for their foolishness. And who vow to carry on as normal because why do you have to change something just because another number gets added onto the year? 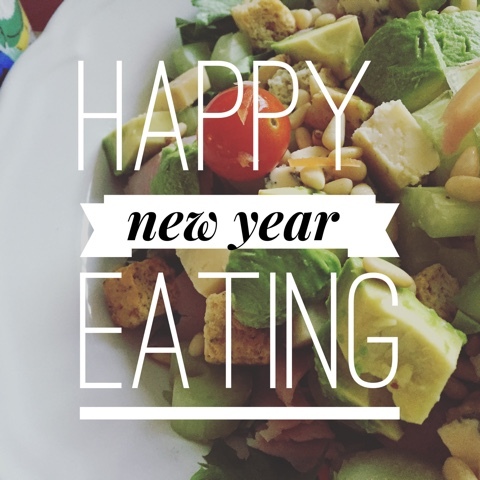 Yes, my friends, I'm going to be eating better and moving more in 2016. You could say it's, ahem, a new years' resolution, if you can tolerate such a cliched label. I'm starting now, a couple of days early, so I guess I can say it's not a resolution after all, it's just I've had enough of gorging and quite fancy some nice fresh veggies instead. Simply put, I'm not doing anything drastic or that I haven't done before. I like eating well and know I can lose some weight when I put my mind to it. And people like the lovely Emma are a brilliant example of what a difference a bit of thought and a lot of perseverance can do when it comes to food. I am happy in my own skin and don't feel like women should always feel the need to be on some diet or other. People who only think about every tiny thing they might put in their mouth often have no joy in what they're doing. To me, if you're counting calories all the time, where's the time to do anything else? Life is too short to not enjoy every moment and having a bit of chocolate if you want it isn't really going to do much harm. From experience, denying yourself altogether ends up making you far more unhappy than being a bit soft around the middle every has. That said, I'm going to be a bridesmaid and a maid of honour at weddings within four days of each other in the summer and I don't want to have to breathe in the whole time to feel my best. So, I'm looking at some of my past posts about eating clean (see my Tuna and cauliflower rice recipe or my pea guacamole idea to get your tastebuds going). I'm back to meal planning, back to juicing and smoothie making and, if another incentive were needed, in a bid to save some pennies, I'm sorting my breakfast and lunch act out by preparing things the night before to take in and enjoy. I hope you all had a great Christmas and that you're enjoying time together with your family - I know I am. With another Christmas over (always sad to say, but am I the only one who kinda wants to take down the decorations now??) and a new year just a couple of days away, we can't help but look forward to what will be in store in 2016. I'm always quite reflective at this time of the year, thinking back on what's been and the good things I want to take into the new year and the not so good things I'll be glad to leave behind. It's such a cliche I know, but I do like to look ahead and think about what I want from the new year - who I want to be, where I want to be and how I'm going to get there. January holds so much promise, with good intentions aplenty and the chance to start afresh. It's really cleansing. Even if the feeling only lasts a little while...! For me, the key to getting things off on the right foot is to be organised. 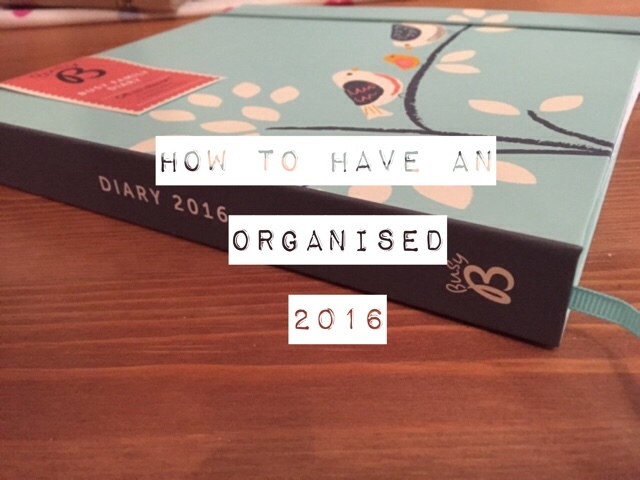 Easier said than done, I know, but my resolution, for the want of a better word, is to get myself organised and plan my life better in 2016. I'm an organised person anyway - from my school days and as a student where I had to find ways to organise my time so I could get homework and revision done, to now having a busy family house - but I need to put planning at the top of my list again to help me feel more in control and give me some goals to work towards. 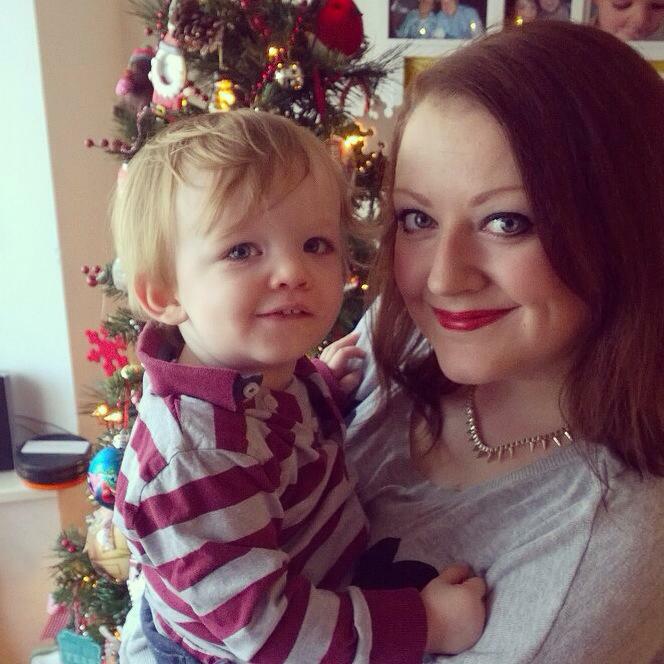 This post is linked to Honest Mum's #BrillBlogPosts linky. I've been a bit quiet on here these past few days and I'm sure you're all feeling the excitement for Christmas like we are. The preparations for Christmas have had me busy with chores, shopping orders, wrapping gifts and doing all sorts of things to get the house ready for the fun ahead. There's always so much to do at this time of year, as the countdown begins, isn't there? I've been fortunate to have had these past few days off as I had holiday left and I've been grateful to have the time, but there's still plenty to do (as a prime example, I've written this whilst sat in the Asda car park, waiting for hubs to get a few last minute essentials). We are having my Dad to stay (he's arriving later today) and then Ste's family over for drinks and nibbles on Christnas Eve. Christmas Day will be spent at home and I'm hosting so have a festive feast planned and plenty of tipples, games and presents to enjoy all day long. On Boxing Day, my In-Laws are having a cocktail party which will be lots of fun. Then who knows for the rest of the holidays. Just lots of time together. Perfect. 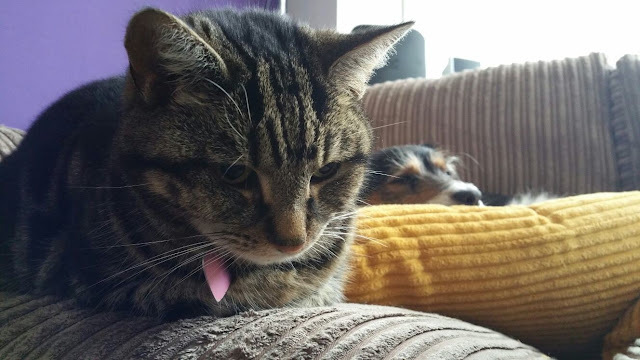 I had wanted to be more organised in here and there's a few things I've wanted to share or plan but I've just had to go wth the flow and just relax about some things. I guess I've just run out of steam and had to put my energy into playing fridge Jenga, to fit all the food in, and to wrapping a shed load of presents (will the pike ever go down??). I'll be back after the festivities have passed and I'll still be over on Instagram I'm sure. 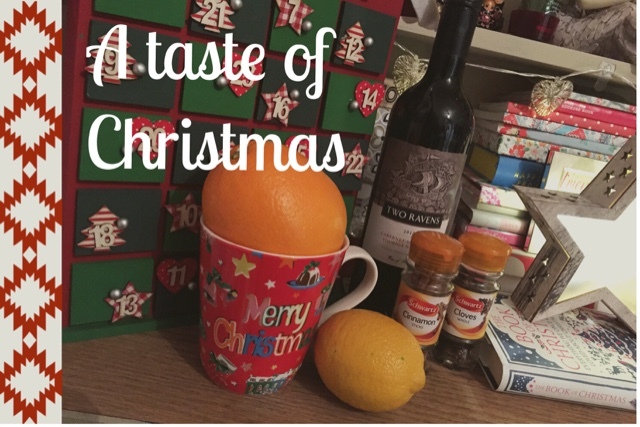 So for now, a big thank you to anyone who has stopped by this blog of mine this year and the merriest of merry Christmases to you all. Eat, drink and be merry and enjoy the most wonderful time of the year with your nearest and dearest. I'm a sentimental old so and so and keep all kinds of mementoes, not just photos and always have. 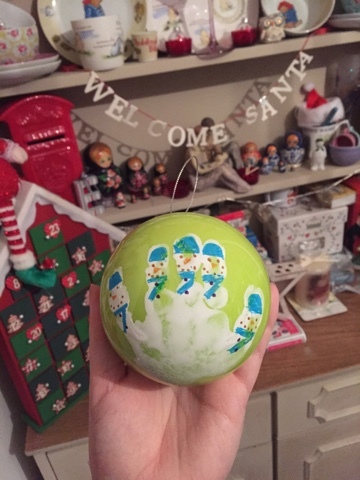 For Ethan's first Christmas, we went to a local pottery studio to make a handprint bauble and then for the past two years, his nursery has made one as a gift for us. Finding the right diary is a big deal for me. More than it probably should be, but I need something that's nice to look at and organised in a way that makes sense for the way my mind works. I'm incredibly demanding and specific. I'm affected by my environment so have to have things that look like I want and do what I need. I can't even tell you how many diaries I have been through this year - I can't tell you because a) I can't remember and b) because it's pretty embarrassing. I'm a stationery hoarder and any pretty new brand or piece of paper that catches my eye sets my heart a-flutter. Trouble is, I want a bit of this one and a bit of that one. I'm like the Goldilocks of the nerds, looking for a diary that's just right. In an ideal world, I'd just make one from scratch to suit exactly what I need. I did find Perfect Planners online, where you can create your diary from scratch, from size and design to all the little details, and I almost ordered one. But, being pernickety as I am, there were just a couple of things that didn't suit me - like no hard / tough cover and worry about space. There's other personalised diary services but the designs haven't grabbed me or I don't like the look of the paper. An organised diary is an organised mind and life to me and I've just ended up procrastinating for hours and days on end. Then I had a look at Busy B. 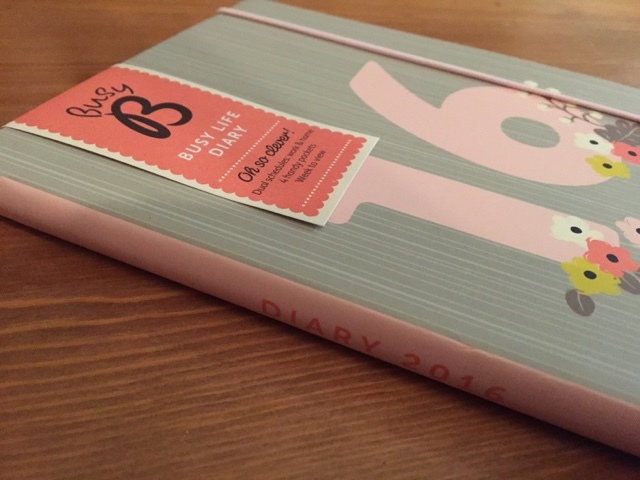 And I was quickly torn between two of their 2016 diary designs; the floral 2016 A5 Busy B diary and the bird design 2016 Family diary. I want space for work, for home and for play, for meeting notes and meal plans and reminders or blog post ideas. I want a year plan at a glance and somewhere to keep notes and tickets. So, both these Busy B options looked very appealing and both seemed to offer a mix of what I need but I couldn't choose between them without seeing them first. I ordered them both and they arrived later the same day (got to love Amazon Prime) and I quickly opened the package up to admire them both and see which one stood out the most for me. Christmas. The most wonderful time of year, in my opinion. And not least because of the food. I love everything about this time of year but the food has to be one of the best things about it. As soon as December starts, it's all about mulled wine, gingerbread and planning a feast for the big day itself. And our house is already littered with Celebrations wrappers. We live by the old excuse, 'we'll make up for it next year'. I will, promise. I was asked by The Co-operative what my favourite Christmas recipe was (you can see their Christmas ideas here). But in my true style, why pick one when you can pick three? As the weekend, I popped to my local store determined to start the festive season with some tasty food. Last weekend, we popped along to Waterstones for a special reading of the classic children's book, We're Going On A Bear Hunt (which is celebrating its 25th anniversary). The book has been made into a stage show and starts at Birmingham Town Hall on Tuesday 22nd December and runs through to Wednesday 13th January 2016, with two performances each day. At Waterstones, two of the actors and the very bear himself were on hand to entertain and Ethan absolutely loved the whole experience. After reading the book, and joining in, there was a colouring competition before the children had to sing along to show they weren't scared, encouraging the bear to come out of hiding. Ethan was so pleased with himself to have spotted the bear and although he was scared when it came to taking a photo with him, he spent the WHOLE day asking where the bear had gone and could we go find him again. And find him again we shall, as we will be going to see the stage show over the Christmas holidays - Ethan will surely burst when he finds out! You could also go on a bear hunt as the Town Hall has given me tickets for a family of four to go along on Wednesday 30th December to see the 11am performance to giveaway (please note, Town Hall has changed the date as to what I previously stated). To be in the chance of winning, please comment on this post, on my Facebook page, on Instagram or Tweet me. I will then put all names into a hat and draw a winner on Tuesday morning now - so be quick! Direct from a West End and international tour, We’re Going On A Bear Hunt will take to the Town Hall stage from Tuesday 22 December 2015 until Wednesday 13 January 2016, with a specially adapted relaxed performance on Sunday 10 January. 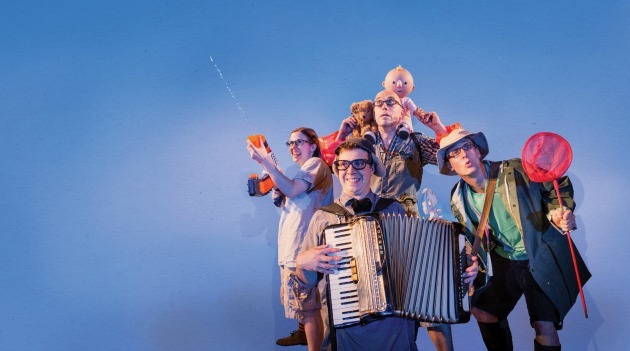 Brought to life by children’s theatre specialists, Kenny Wax, this fun filled adaptation is directed by the acclaimed Sally Cookson and will feature catchy songs, interactive scenes and plenty of hands-on adventure - plus a few special surprises along the way! Set to Benji Bower’s versatile and lively score, the show promises to delight and entertain the whole family this festive season. Originally written by author Michael Rosen and illustrated by Helen Oxenbury, We’re Going On A Bear Hunt follows intrepid adventurers of a family on their quest to find a bear; as they wade through the gigantic swishy swashy grass, the splashy splashy river and the thick oozy, squelchy mud! Our specially curated relaxed performance is supported by Autism West Midlands and is designed for people with an Autistic Spectrum Condition, a learning disability or sensory and communication disorder. The performance is produced by KENNY WAX whose Laurence Olivier Awards include: The Play That Goes Wrong, Top Hat and Once on This Island. His Olivier nominated shows for family audiences include: Hetty Feather, The Tiger Who Came to Tea and Tall Stories’ production of Room on the Broom. We’re Going On A Bear Hunt will be at Birmingham Town Hall from Tuesday 22 December 2015 until Wednesday 13 January 2016. For more information on show times please click here. For more information please visit www.thsh.co.uk or call the Box Office on 0121 345 0600. It shines light on the dark. It warms our faces and our hearts. It's not always in sight. And sometimes seems so far away. Never far from our thoughts. And present in every way. You to me are like sunshine. You are my strength and my reason. The beauty of a young boy. Who looks at you and calls you 'Mum'. Isn't anything you can hold in your hands. I am so proud to call you Son. My love for you glows from within. And it will never, ever fade. How good this life can be. And be the brightest thing to see. 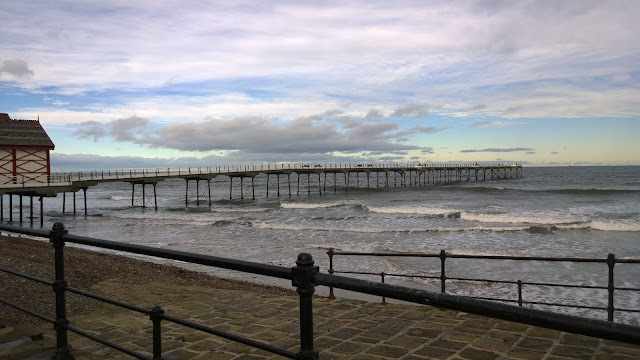 Last weekend, we went away with friends for our annual mock Christmas celebrations, to a cottage on the East Yorkshire coast. I have several photos to share from the weekend (a #LifeLately post is coming later in the week) but for now, I wanted to share some creative photos I took whilst we were away that I think are pretty cool. I can't take credit for the cow photos, hubs took those, but anyway, I really like these fun moments we got to capture. For the past few years, I have tried to make most of our Christmas cards myself. Making them as opposed to buying them isn't cheaper, as it depends on the designs your creating and the materials needed, but no matter what, it's so rewarding to do and I think people really appreciate the thought that goes into a hand crafted card. With less time on my hands than before, I still want to craft but have to keep it simple, so the following designs fit my budget and the time I have to make enough cards for everyone. 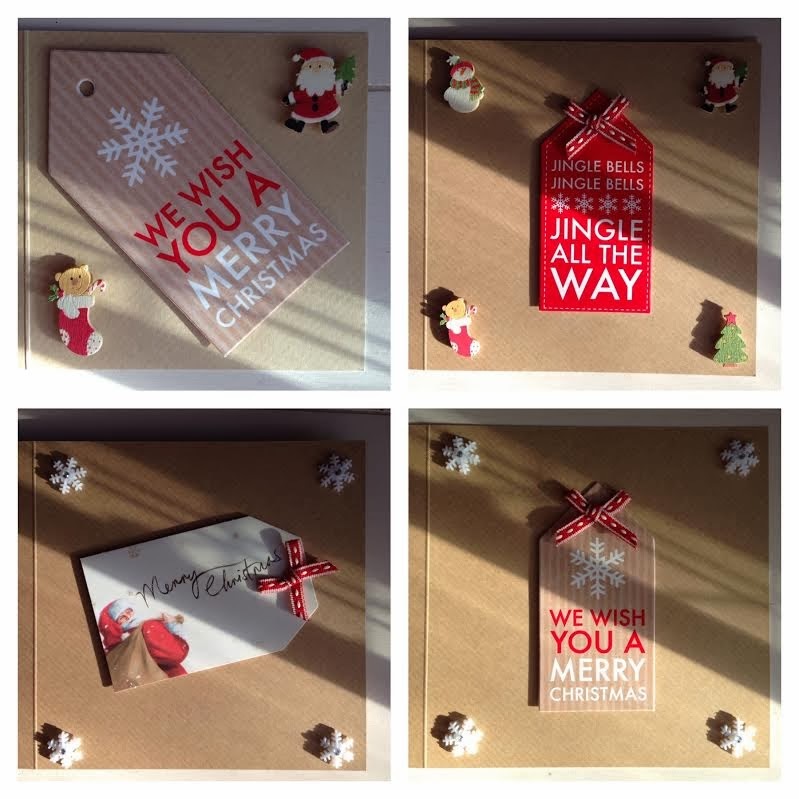 For this idea, all you need is some card blanks (try The Works for great prices and bumper deals), a range of gift tags (I bought a pack of 24 Scandinavian style tags in Asda for just £2 and the others were just 50p from M&S in the sale last year) and a few buttons, sparkly bits or other festive toppers plus either double-sided tape or sticky foam pads. With the start of a new year on the horizon, I've already started planning for 2016. I'm not wishing away Christmas, not one little bit, but I do like the fresh start feeling a new year brings and next one should be a great one for us for many reasons. I'm always quite reflective at this time of year and like to look back on the times that have been, things that have changed and what we have to be grateful for. You'll know that I love my photos and by this time each year, I love flicking through all the different moments and reminding myself of everything we have done with family and friends. It's such a simple idea but making your own photo calendar for someone is a great gift as it reminds them of fun times, can be enjoyed all year round and it's useful too. And it really is the thought that counts. 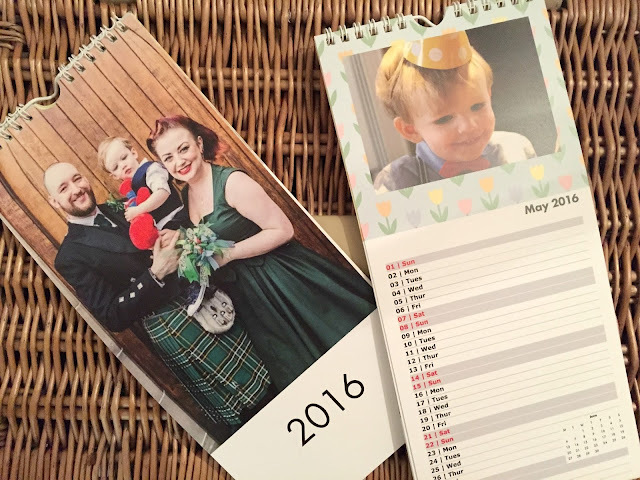 With photo gifts, I can really get carried away sometimes and spend hours getting things just right - I'm a bit of a perfectionist - but when I came to try the Snapfish calendar designer, it couldn't have been easier. 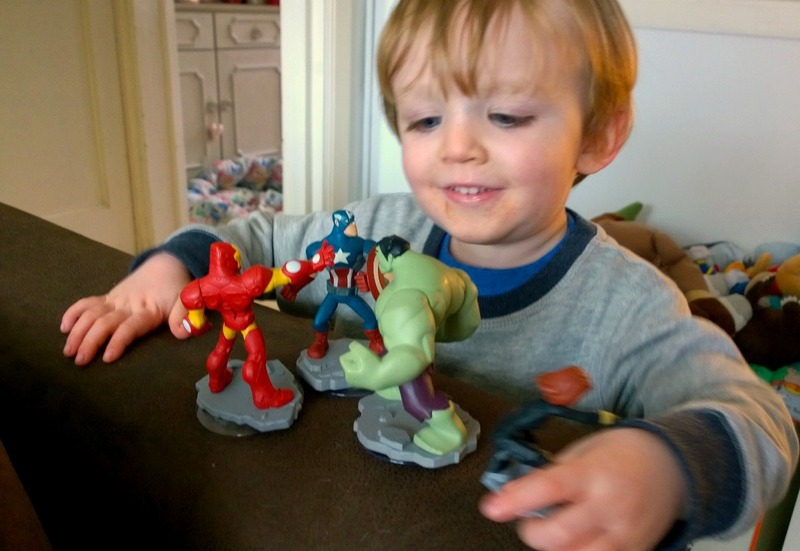 How tricky do you find getting your little one(s) ready in the morning? Waking them up, encouraging them out of bed, changing their nappy / going potty, dressing them (more like wrestling with them) then trying to coax them into the bathroom to clean their hands and faces. And brush their teeth. Ethan is hit or miss as to whether he wants to clean his teeth. Some mornings, nothing is going his way and it can be a real struggle and lead to some tears. It's all over and done with quick enough, but sometimes he really doesn't like it for no apparent reason. He's been very good though this past week, which may have something to do with some fun characters that have come into our bathroom. Ethan's been sent an Inside Out Brushtime Kit by Aquafresh to help him have more fun and learn how to brush his teeth properly, and it's come just at the right time. Do you ever look at your little ones at brushtime and wonder what’s going on inside their heads? They could be experiencing a range of different emotions, like the ones featured in Disney.Pixar “Inside Out”, out now. 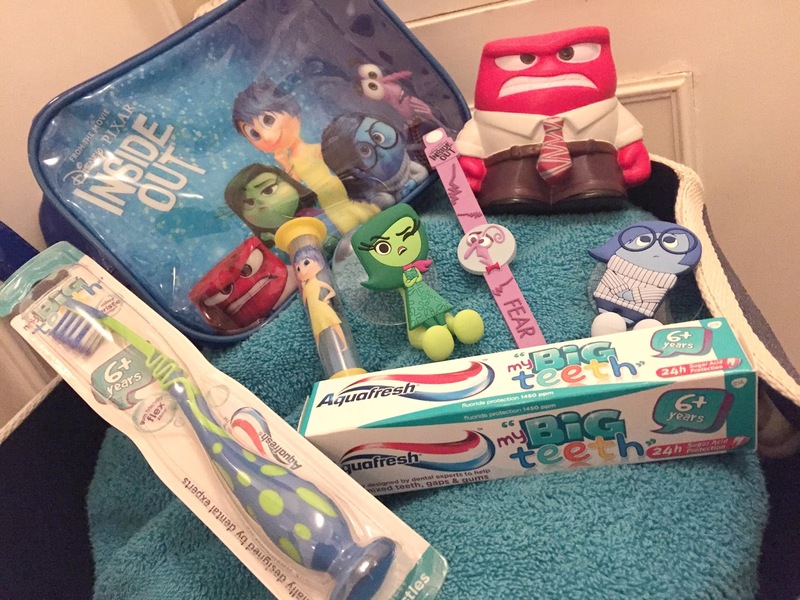 However your child feels about brushing, this fun kit is sure to raise a few smiles at brush time - anything's worth a shot, right?! 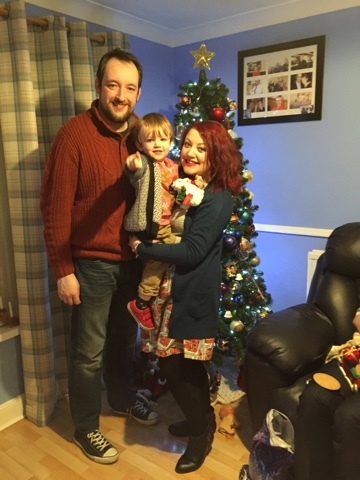 "To Become Mum began as a place for me to record my adventures in mummyhood and is now where I share my life and loves, from being mum to being me and everything in between." Whilst Christmas for me is all about treating my family - be it to new experiences, plenty of nice food and drink and a thoughtful present or two - I'd by lying if I said I didn't like receiving something under the tree. We all do, don't we? Of course, being together is the most important thing, much more so that how much you spend - that's a given really, isn't it? - but it's always nice to receive a present that someone has taken time to think of and wrap up for you. So I let myself have a virtual window shop and a good think about what I might like the man in red to bring me. If I've been a good girl, of course. (I have). As the nights draw in and a chill fills the air, the perfect warming dish is often a bowl of soup. It's a really convenient option for work too, as you can just take a can in with you and heat it up in minutes. Simple, a cheap option and filling too. I really enjoy a good soup and Ethan does too - he likes to get his bread super soggy first! Sometimes though, I think a humble bowl of soup needs a helping hand. Just something on the side to make it into more of a meal. To add to the flavour. To mop up the leftovers. 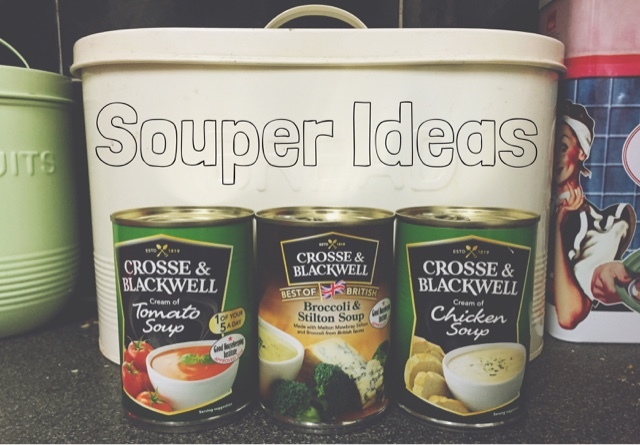 So, whilst I always have a can in my drawer at work and one or two in the kitchen cupboard at home, for emergencies, Crosse & Blackwell asked what my ideas would be to make my humble bowl of soup more appealing or to make it into a tasty supper or even starter when having friends or family over for dinner. 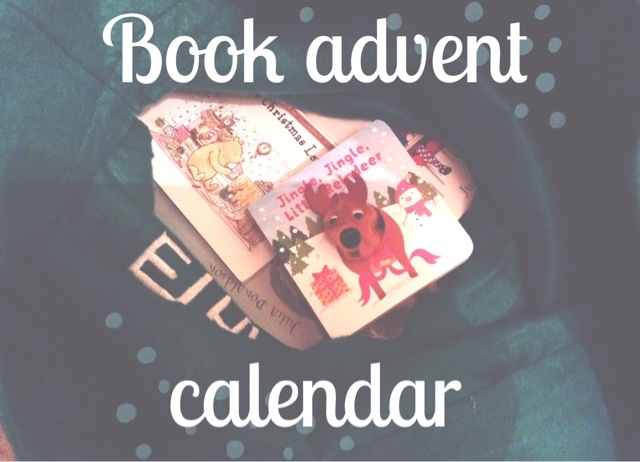 Although we have an advent calendar (one I made and love to display each year), I want to do something a bit different this year. I saw a few people sharing this idea on Instagram and Facebook and thought it was lovely. 24 days in December, leading up to Christmas. A book for every bedtime. Such a simple idea but a great one that gives more than just a chocolate treat. I realised that I'd already collected several books for Ethan this year. I'd bought a couple a of Julia Donaldson's books that he doesn't already have, a Mr Tumble mini library, a Thomas the Tank Engine book with torch and a Christmas fuzzy felt book to name a few. I was half way there without trying! Our family pics are more often snaps on the phone as Ethan fidgets too much and there's always one of us behind the camera. 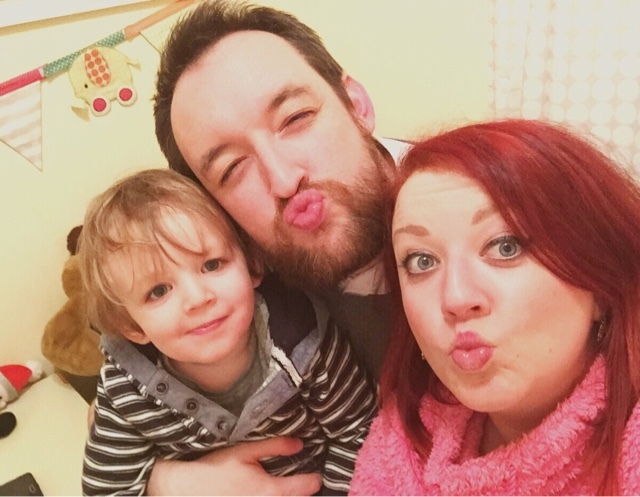 I'd love to have some family snaps like those Mummy Daddy Me or Bump to Baby take each month (one day...) but for now, I'll make do with a few selfies before bedtime. When I'm wearing my fluffy, oh so flattering PJ top, and hubs is pulling funny faces and Ethan's avoiding having to go to bed. This is us on a typical night. Singing Christmas songs, playing the tickle game and taking it turns to read stories. We're pretending to be dinosaurs in the last one, by the way. This hamper gets me very excited. 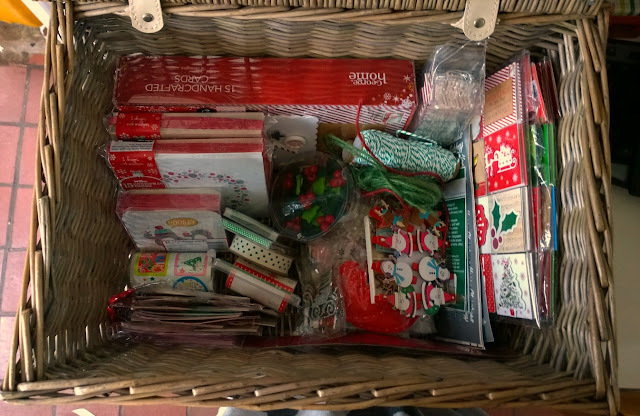 It's filled with all my Christmas crafty bits. And it's ready and waiting for me to get my craft on! 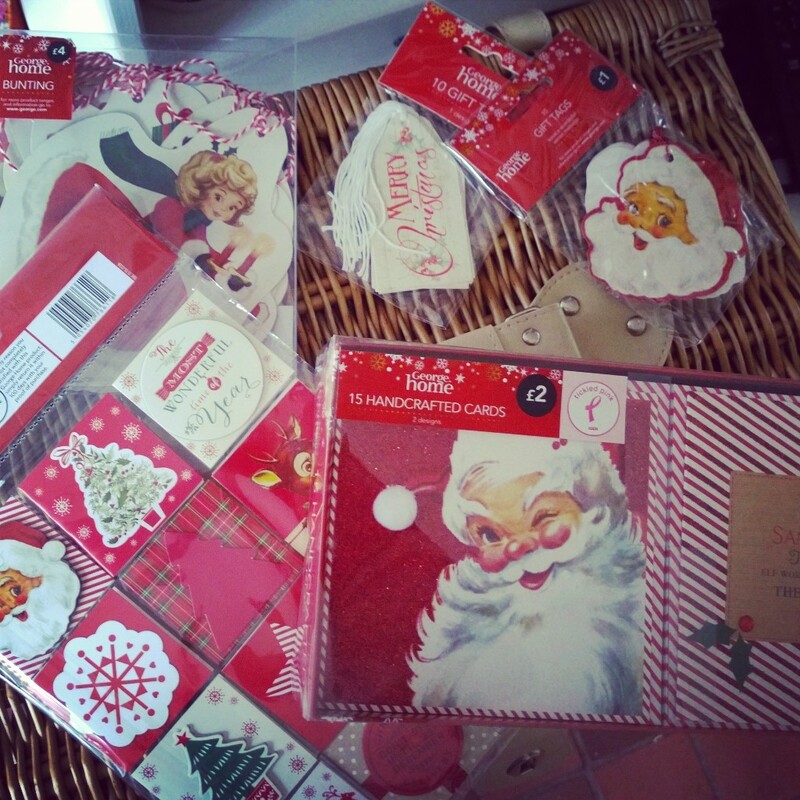 I have ink stamps, ribbons, gift tags and embellishments aplenty and I've planning on making some nice cards and tags if I have time for best friends and family, then using the Asda bargains in the second photo to top up numbers. 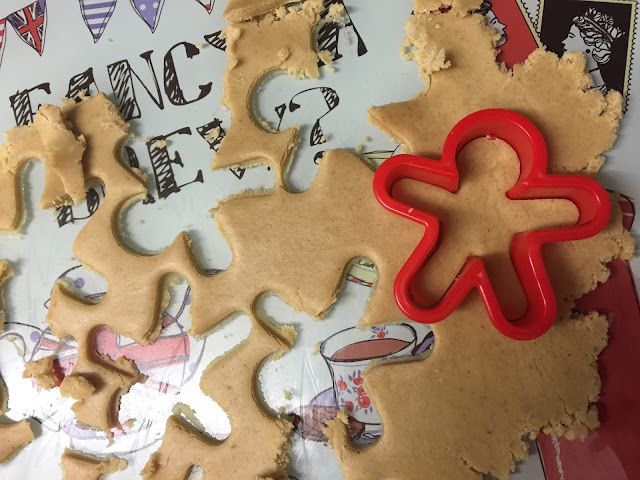 I'd love to have a fully home-made Christmas but I just don't have as much time as I would like. Ethan's helped me make a couple of cards already and I'll look forward to having a proper Christmas helper in the near future too - would love to try Jocelyn's hand-print Christmas tree. I vividly remember my Christmases past. Father Christmas delivering to me my first bike, in the snow, whilst my Dad had mysteriously disappeared. Meeting Father Christmas at the grotto at the school we lived next to during a festive fayre and thinking that he wore the same wedding ring as my Dad but I still promised I'd been a good girl just in case. Leaving a carrot for Rudolf and a glass of sherry and a mince pie by the fireplace for the man in the red suit. Opening my stocking on my parent's bed and having chocolate for breakfast. Playing games after Christmas dinner with my grandparents and opening our special table gifts. My husband has many fond memories too, such as opening all his Christmas presents on Christmas Eve after midnight mass every year and playing his new video game and completing it by Christmas Day night. We both love the season so much and it gets even more magical every year as Ethan grows and understands more of the sentiment and tradition. We keep many of the usual traditions and have several of our on too. It's what makes Christmas Christmas, in my opinion. But do you ever wonder where some of them first originated? These are my three special guys. 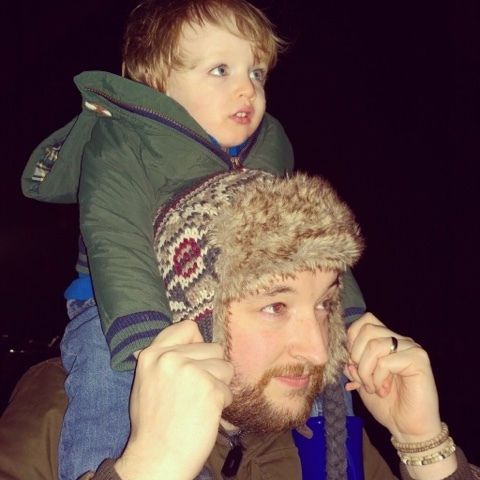 Hubs, Ethan and Watson. Posing nicely for a photo as I was rushing out the door earlier this week. I just love the simple moment captured, how they're all sat on different steps. And the way Ethan is looking at his Daddy in the second snap just melts my heart. Simple. Grainy. But perfect candid snaps. I'm excited that in just a week or so, it will be socially acceptable to hang my Christmas wreath on the door. This is a question I have come to ask myself recently, when I've taken a step back and really looked at the way I think and do things. When you first start on your journey to become mum, you know that your priorities will need to change and that the needs of another will soon trump your own, every single time. When that line turns blue and you know that a baby is indeed on its way, you feel different because you know you have this responsibility to nurture and protect. Suddenly, everything you do has a direct impact on your baby. What you eat. What you drink. How active or inactive you are. How much sleep you have. Even what you wear ends up being determined by how much stretch it has and if bump feels comfortable. And of course, you don't complain. Much. You knew you would need to adjust and you're compelled to do all that you can for your baby-to-be. For me, as soon as I knew that I had a little bean (our nickname for Ethan before we knew who he was) I immediately thought about what I was doing and how that might impact on him. I read up on the nutrients I should be getting from my food, I never missed a breakfast and I always had a snack pack for when I could feel my energy levels dip. I have never taken care of myself as much as I did when I was pregnant. Soon after Ethan was born, all my good habits all but dissipated. No more regular breakfasts. Much more lax about my eating habits. Nothing too bad really but I certainly wasn't a goody two shoes any more. You're more than two and a half now and whilst it's been two months since my last letter, that's not because nothing has happened or there's no memories to document. I've said it before but I just love the age you're at. You're curious. Interested. Animated. You go through all the emotions, quickly, without warning and in full. You understand so much, you sing to yourself, you role play and you like so many characters and animals and toys. The list of things you enjoy is so long and one new thing never replaces another; it just adds to everything you like to watch, see or do. Hello! How are you all? Well, I hope. Me? I'm a bit worn out. I'm like one of those solar controlled nodding figures - as soon as the sun goes down, I start to power down. As any working mum knows (heck, any woman really), life is a constant juggling act and if one thing is going well or keeping you busy, there's a knock on effect and something has to give. Work is always busy and trying to keep everything going at home can be hard sometimes. (More on this theme to come later this week... if I get the time, that is!). 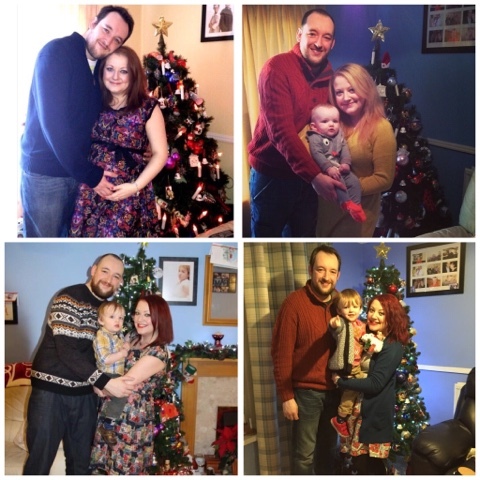 We've had lots of time together as a family and plenty else going on too, so we are very much counting down to the Christmas holiday and I hope to start the festive feeling soon. My little bookworm's library continues to grow and the Mickey Mouse Storybook Library from Parragon, through their #BookBuddies scheme, is the latest addition. As a fan of all things Disney, Ethan was really excited to receive this collection. The books are a good size, so you can take them away with you when you're out and about, the illustrations bright and the stories brief but fun. 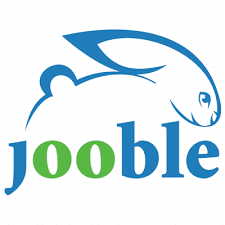 Great for young readers and definitely for Mousketters. 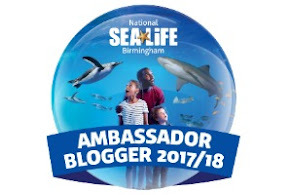 A couple of weeks ago, Ethan became an honoury Octonaut cadet when we visited the Sea Life Centre Birmingham. 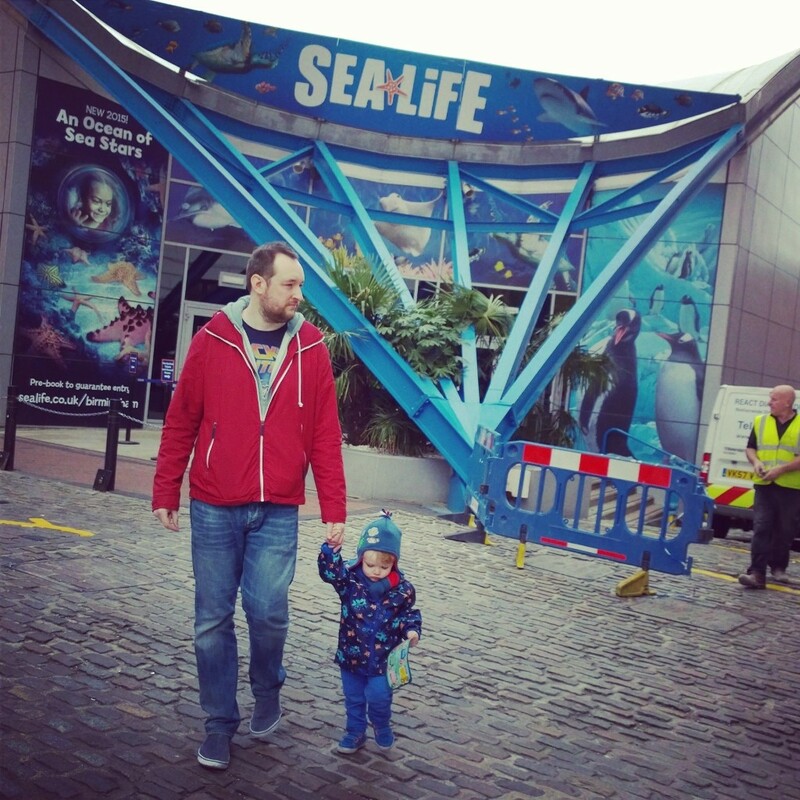 It's one of our favourite places to go - anywhere with real animals goes down well with my animal loving son - and the Octonauts have taken over again. When we went, there was a training academy theme running, encouraging little deep sea explorers to look out for certain things as they walk around, collecting stamps and winning a medal at the end for getting them all. The older he gets, the more Ethan takes in and this time, he even sat through the 4D cinema film without getting scared. The penguins were still his favourite but I have to say, one of my favourite moments was when he saw the sharks and said 'hello shark, don't eat me!'. 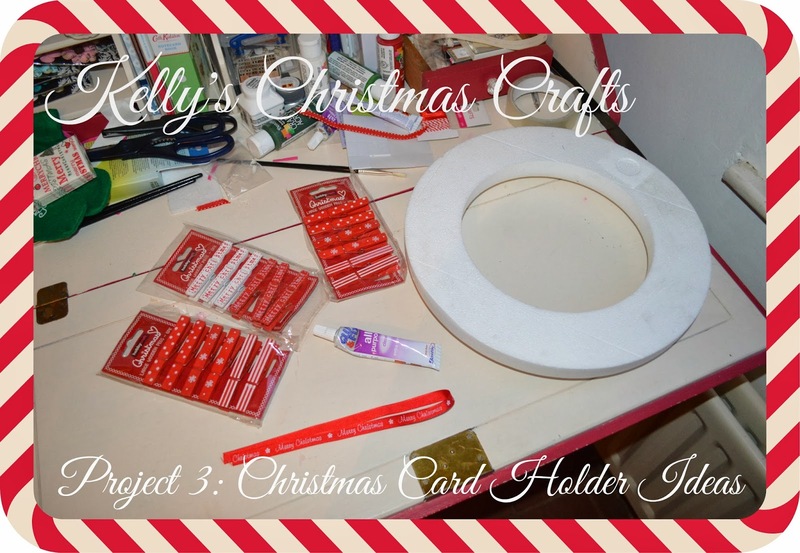 I'm re-posting another Christmas craft project today, following on from my advent calendar, and this one is super easy to make. I've had a few treats this month that I wanted to share with you - we all need a pick me up now and then, don't we? I've heard a lot about teatox programmes on Instagram and from various bloggers and wanted to give one a go myself. I've fallen into some bad habits recently (I blame the darker nights for my addiction to carbs and to Asda putting Ben and Jerry's on offer) and I wanted to try and undo some of this with a detox. In steps Tea Doctor! 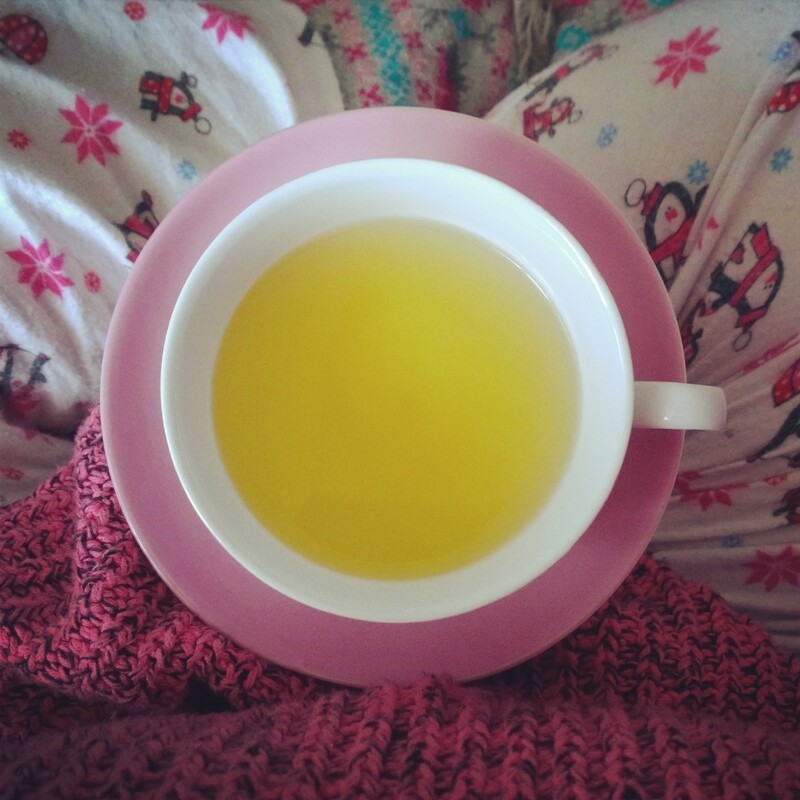 A teatox is exactly what it sounds like - drinking tea to detox and help flush out any toxins built up in your system, to help you feel good and possibly shed a little weight too. I love this time of year and we always go and see a fireworks display and bonfire. It's the perfect excuse to wrap up warm, get outside and drink hot chocolate. 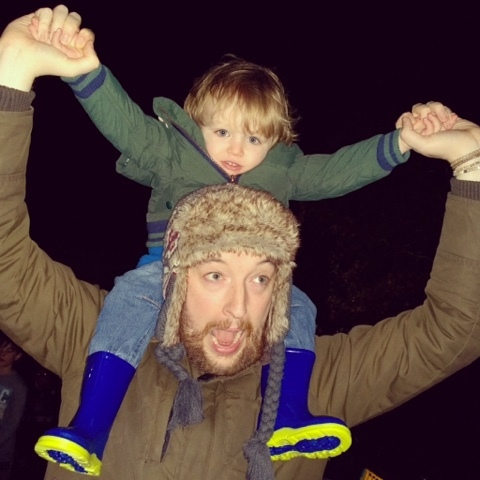 For a few years now, we've gone to the fireworks festival at West Midlands Safari Park. It's brilliant. Aside from the safari, you can visit all the other animals, enjoy a hog roast and Baileys hot chocolate and there's rides too. But for us, the huge bonfire is great and the fireworks, times to music, are amazing. Last night, the theme was the movies, and the display lasted for 15 minutes. It was incredible and little man, although a little scared halfway through, perked up when Let It Go and Circle of Life played. So, Halloween has been and gone so I think it's safe to mention Christmas now and, even more than just mention it, post about it properly! 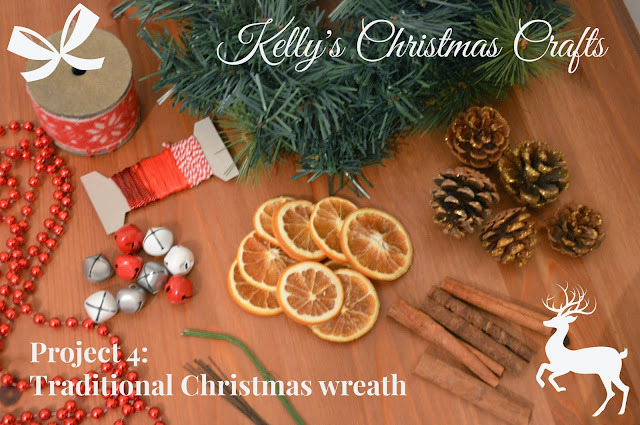 Two years ago, I shared a few Christmas craft projects. 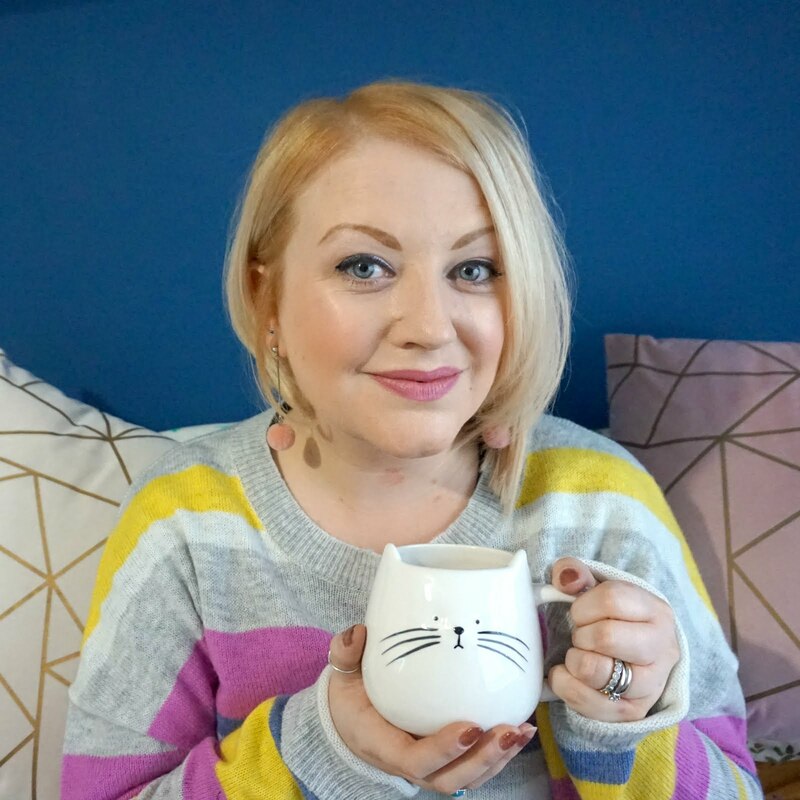 I was on maternity leave at the time and somehow found time to indulge my crafty side so I thought I would re-post some of my ideas in case you're looking to make something special for your home. So, I'm starting with an advent calendar. There's many beautiful ones you can buy ready made in the shops and for a good price too (anywhere from Asda to Next to John Lewis have their own versions on sale), but personally, the advent calendar I bought from Hobbycraft and decorated myself is pretty special. This year, Hobbycraft has not one but five different blank wooden advent calendar designs to choose from, and they are all amazing - so much so, I want to make another one! There's a house, which is a bit more square than the model I picked up, which has doors that open (mine has drawers), a tree, a Santa truck, a pile of presents and a reindeer sleigh, all of which are just £15 which I think is a fantastic price. I'd be quick if I were you, as they're bound to sell out as we get closer to December. And of course, they sell all the paint and accessories you need to decorate these in any way you wish. As we are a family of three, we've been staring some new traditions and at the centre of this is our advent calendar. We decided we wanted an advent calendar we can use every year and our idea was to not only have a chocolate treat waiting inside but also a seasonal task. From watching Elf to baking gingerbread, singing carols and reading 'Twas The Night Before Christmas. We've just had a little over a week off together as a family. It's been long-awaited and began with a wedding and ended with a PJ day. The first weekend was my Brother-in-Law's wedding. 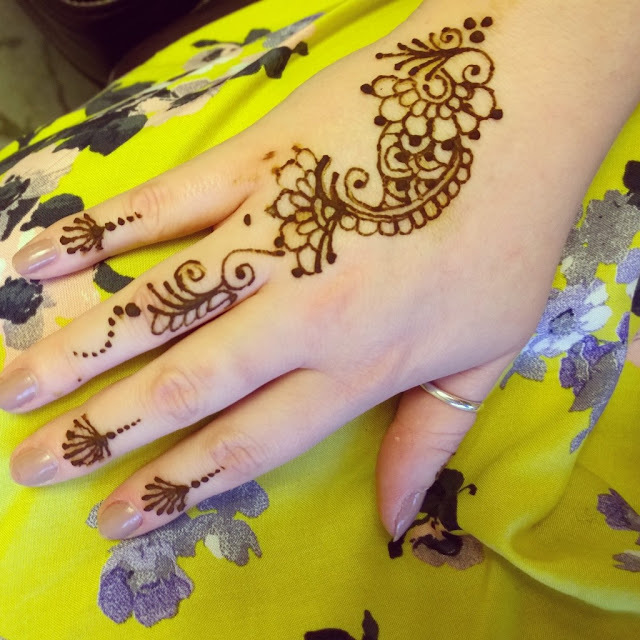 It began with a Mendhi celebration at the bride's parent's house, where the women attending had their hands decorated with intricate henna patterns. Hello, I'm Kelly and I am a Starbucks addict. As my local Starbucks runs out of Pumpkin Spice Latte, I'm not too glum as it's almost red cup season again. When it hits November, I'm rarely seen without a Gingerbread Latte in my hand. My Starbucks obsession continues at home where I like to treat myself now and then to one of their syrups to jazz up my cuppa and I have quite an impressive collection of mugs too from places I (and my friends) have visited. 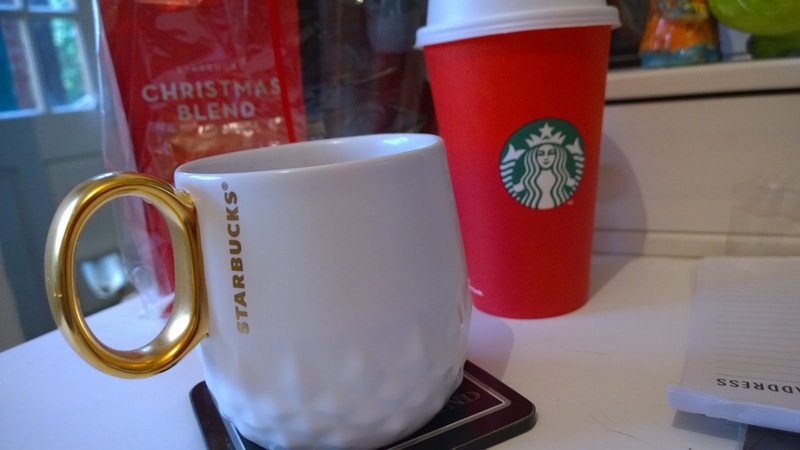 So, what does the Starbucks Christmas 2015 menu have in store? Photos, photos, everywhere - and what better way to use them than to make the perfect (Christmas) gift? I've written many times before about how I'm as snap-happy as the next blogger / proud mama and how I'm always looking to make the most of my photos. And part of this is making special gifts for friends and family. I've made personalised calendars for friends and family for a few years now (I missed out last year to the disappointment of some!) and I've been looking for other fun ways to bring photos, and the memories they represent, to life. And Snapfish, my go-to online photo service, have quite a few photo gift ideas on offer, including coasters. Now, everyone has coasters at home and we have an eclectic mix ourselves - ones given as souvenirs from friends' holidays and others with funny slogans on like 'I child-proofed my house... but they keep getting back in!' 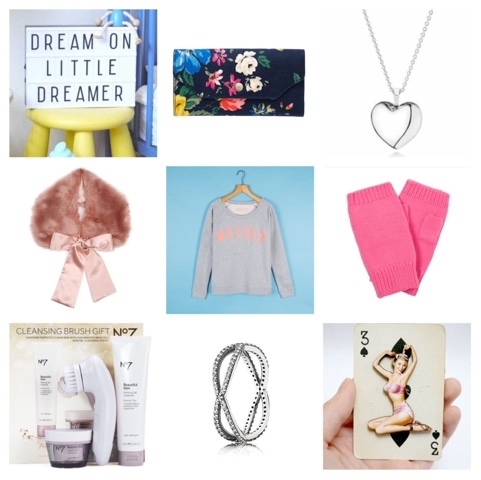 - so what better gift idea than making a set specific for someone in your life? Armed with the trusty photo editing site picmonkey.com (where I go for all my blog and photo amends), I thought I would have a play and find a new way to use photos and other ideas to create some creative coasters. Whether you're tricking or treating today, carving pumpkins or watching a scary movie, it seems everyone is getting on the Halloween bandwagon this year, doesn't it? Apparently, it's the next biggest occasion on the calendar in the UK, after Christmas and Easter, and it does seem to be on a much bigger scale again. 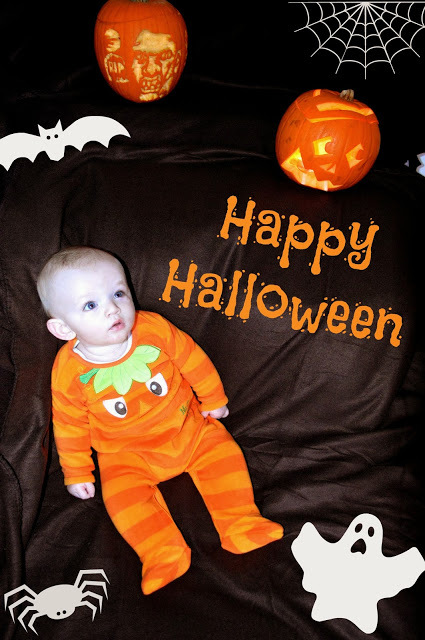 Ethan enjoyed a fancy dress day at nursery and has been invited to a party this afternoon (we'll be using the same skeleton costume from Asda for both!) and while he's still so young, it's just another excuse to get dressed up and eat chocolate.